I have high arches and this insole is the best. I have a pair of tennis shoes that are flat . With this support I have no pain under my arch or heel. The inserts worked well. I did not need to mold them because I have a high arch. Advantages: Thin and arch rise was in the right spot for my feet. Surface area is comfortable and molds to the shape of my feet. Advantages: Surface area is comfortable and molds to the shape of my feet. Very light materials becsuse the bottom is made of recycled wine cork. Very well made out of leather material. My husband had tried multiple insoles before these SOLE Softec response causal custom moldable orthotics. He thinks they are awesome even compared to the $400 ones he got from the doctor. Curious to see how long these last. Love these inserts, will purchase again. Not helpful for severe pronation simply because the orthotic molds to the pronation and thus does not provide additional suppport. Good arch support and good size fit. Great product. I now have a set in various pairs of shoes. Not sure if I like these in-soles. I stand on my feet in surgery between 8-10 hours a day and I was only able to wear them for about 3 hours. I’m going to try to use them again. I am on my feet, on concrete all day. These insoles not only save my feet they save my legs from being in pain. Love them!!! Advantages: They mold perfectly to my feet! These are fantastic! I have needed orthotics since I was 14 years old. I used to have them custom made. 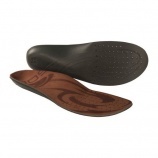 As an adult I have tried to find comparable orthotics to those I used to have custom made. THESE ARE IT! They are very comfortable and very easy to break in. My feet, knees and hips feel back to normal again! Thank you Orthotic Shop! Please, PLEASE do not discontinue these. It has taken me many, many years to find a good pair! I like these so well, I bought two more pairs for other shoes so I don't have to switch the one pair around so much. Advantages: I haven't had any arch pain since I started wearing these in my shoes. Disadvantages: I could wish they provided more a more cushiony feel. The arch didn't mold right away with the oven heat, but a couple days of wear afterward did the trick. Using them in my golf shoes and have been very satisfied. Advantages: Size to fit and no trimming was required. These are pretty good. Great for shoes with a low foot volume which was my reason for trying these. And I do like the heat moldable feature. Hi Quality and very effective. These are the most versatile moldable insole. I hope they are not being discontinued by the manufacturer! They fit almost any shoe with enough toe room, have great arch support when heat molded, and wear so well compared to other models with fabric top layer.